The Catholic Herald runs a column called ‘Heretic of the Week’. 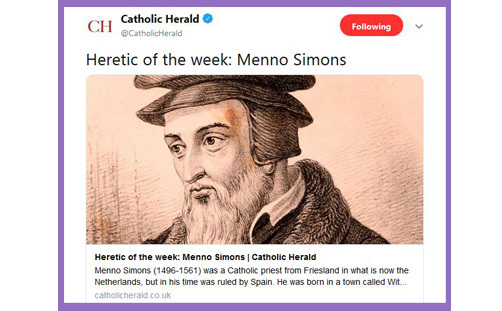 It hasn’t been running for many weeks, which is probably why it isn’t that widely known, but a recent tweet featuring Menno Simons – an influential Anabaptist and founder of the Mennonites – was worth a sharp intake of Twitter breath, for until this week the heretics have been those who contended against what has become the orthodox understanding of the doctrine of God or the human-divine nature of Christ – Arius, Nestorius, Eutyches, Pelagius – along with a couple of more recent false prophets: James Pike and Ann Lee. 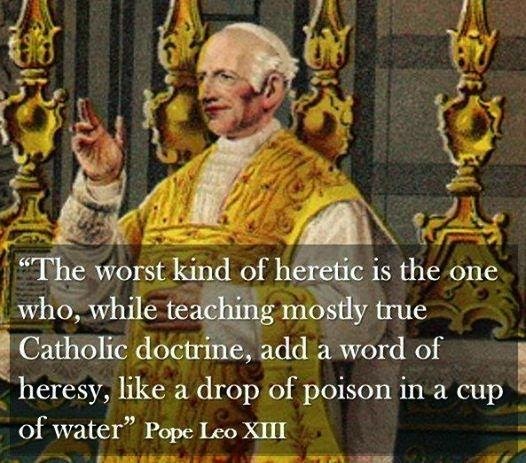 If you go around denying the Trinity and the Virgin Birth or declaring yourself to be the Second Coming of Christ, you’re a heretic, no doubt about it. The Magisterium of the bishops and of the Pope stand under the Word of God in Holy Scripture and Tradition and serves Him. It is not at all Catholic to say that the Pope as an individual person receives directly from the Holy Spirit the Revelation and that he may now interpret it according to his own whims while all the rest are to follow him blindly and mutely. Amoris Laetitia has to be absolutely in accordance with Revelation, and it is not we who have to be in accord with Amoris Laetitia, at least not in the interpretation which contradicts, in a heretical manner, the Word of God. And then reiterates: “Under Pope Francis, the Church is now ‘openly ruled by an individual rather than by the authority of Scripture alone or even its own dictates of tradition plus Scripture’; and calls into question his “appalling” judgment: “If the Pope said that, or anything that fairly amounts to that, he would be a heretic.” The Roman Catholic blogosphere is full of heresy chatter, though Pope Francis himself apparently avoids reading heresy accusations for the sake of his mental health. Which is understandable, really, for being called a heretic is… well, a bit upsetting when all you’re trying to do is worship God in spirit and truth and serve the Church with humility and grace in accordance with the revealed Word of God. It must be just as upsetting as being denounced as Christ’s enemy and Antichrist for perpetuating false doctrine. The Catholic Herald is unlikely to feature Pope Francis as ‘Heretic of the Week’ any time soon, but a historical polemic on Thomas Cranmer must be looming. We can look forward to that, not least because it will bring us back to seemingly endless debates about Scripture, Tradition and the Magisterium; and provide another opportunity for this blog to contend against the narrow bigotry of sectarianism and assert “our common faith in the Lord Jesus Christ, to bring relief to the suffering, to bring peace where there is conflict, to bring dignity where it is denied and trampled upon”.